*What if I already have ​Legal I & II Update? Licensed Sales Agents who applied on or after September 1, 2012 must show evidence of having completed a minimum of 90 hours in qualifying real estate education and 4 hours in Legal Update I and 4 hours in Legal Update II prior to the first two year license term, for a total of 278 hours by the end of the second year of licensure. View PDF on desktop, laptop, tablet, iphone or Ipad. Student may take a portion of the course, Bookmark it and resume the class later. If you are subject to SAE you are required to complete the education requirement even if you are renewing on an inactive status. Renewals without education for this type of license will be rejected. Both SAE and fingerprinting should be completed at least 10 days prior to the license expiration date. Fingerprinting is not required for a timely renewed inactive license if you are subject to SAE. Licensed Sales Agents who applied on or after September 1, 2012 must show evidence of having completed a minimum of 90 hours in qualifying real estate education and 4 hours in Legal Update2018-2019 I and 4 hours in Legal Update II 2018-2019 prior to the first two year license term, for a total of 278 hours by the end of the second year of licensure. See the appropriate text and chart on the Sales Agent Apprentice Education (SAE) requirements page. 100% Self Paced! Not a timed, online course. Finish quickly! COMPLETE YOUR SAE IN AS LITTLE AS 10 DAYS! *Our courses are in 100% Self Paced PDF Format! Get help from our trusted & experienced counselors and instructors during your courses! Complete your Texas real estate continuing education requirements. Our courses are designed to help you fulfill your CE credits for your Texas real estate license renewal. 360training.com is offers you the convenience of studying at your own pace in any location with Internet connection. Our Texas real estate MCE and SAE online courses meet the requirements of the Texas Real Estate Commission. 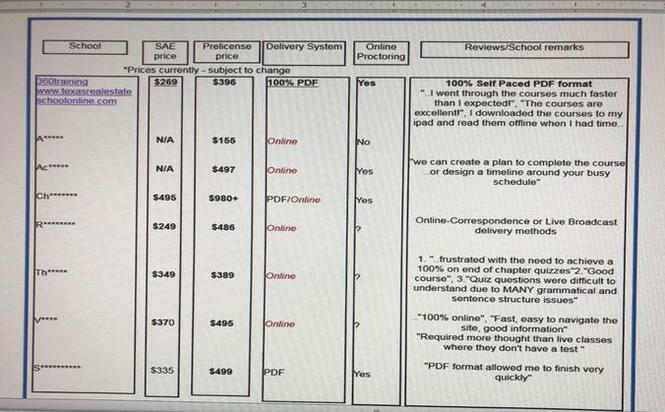 Prior to September 1, 2012, some salespersons under the Salesperson Annual Education (SAE) requirements were to complete courses on an annual basis. On September 1, 2012 and after, salespersons will be required to complete their education renewal requirements during the two year license term. All active and inactive salespersons, who are under the Salesperson Apprentice Education (SAE) requirement, must show evidence of having completed a minimum of 90 hours in core real estate education during the two year license term, so that a total of 270 classroom hours have been completed by the end of the second year of licensure. Evidence of successful course completion must be posted to the TREC computer system prior to the online renewal process or the license will expire. Evidence of course completion cannot be submitted during the online renewal process. You must submit your hours at least 10 days prior to the date you wish to renew online. TREC’s email address (for mailing certificates) [email protected] and FAX number 512-936-3864. All active and inactive sales agents, who are under the Sales Agent Apprentice Education (SAE) requirement, must show evidence of having completed a minimum of 90 hours in qualifying real estate education and 4 hours in Legal Update I and 4 hours in Legal Update II prior to the first two year license term, for a total of 278 hours by the end of the second year of licensure. Evidence of successful course completion must be posted to the TREC computer system prior to the online renewal process or the license will expire. Evidence of course completion cannot be submitted during the online renewal process. You must submit your hours at least 10 days prior to the date you wish to renew online. Course completion certificates may be emailed. TREC’s email address (for mailing certificates) [email protected] FAX number 512-936-3864. You may renew your license up to six months after the expiration date. After six months and up to two years past the expiration date, you may apply for reinstatement of your license. After two years past the expiration date, you will have to reapply and pass the examination. This is SAE course is approved by TREC covers every topic as required by TREC guidelines for SAE. This Texas property management course will help licensees who work as property managers, or are considering becoming property managers, develop a comprehensive understanding of the field. It begins with an introduction to the factors, economics, law, responsibilities, and operation of professional property management. Learners will explore marketing principles and activities, opening and running a property management office, and managing relationships with owners and tenants. Next, we discuss analyzing and managing residential and commercial properties, the nature and types of leases, risk management, and applicable state and federal law. The course concludes with sections detailing the managers maintenance and safety and security responsibilities. - Explain the nature of the manager-owner relationship. - Establish a complete and effective management plan for a property. - Recognize appropriate agreements and reports for the property. - Describe marketing principles and activities as they relate to marketing rental properties. - Discuss how to develop an advertising campaign strategy and how to gauge its effectiveness. - Explain the advantages and disadvantages of various advertising methods. - Summarize the importance of the promotional efforts by management and the value of the personal selling efforts of the manager. - Describe the necessary elements and staffing requirements for a management office. - Explain factors necessary to determine management fees. - Summarize the information required to complete financial reports. - Identify information and documentation required for determining tax liability. - Recognize three methods for determining profitability. - Contrast the differences among three different property management relationships. - Describe the elements of a management agreement. - Summarize how to build and maintain satisfactory relationships with owners. - Describe different types of residential property and how valuation is affected. - Summarize how marketing is influenced by the type of property. - Discuss methods of managing tenant relations. - Identify the roles of various building staff and their roles in maintaining the apartment building. - Explain residential operating reports. - Distinguish the differences when managing cooperatives, condominiums, and Planned Unit Developments (PUDs). - Describe the importance of accurate budget projections when determining management fees. - Summarize the issues involved when managing subsidized housing. - Explain the similarities and differences of managing manufactured home parks and housing for the elderly. - Classify retail properties by market area, patterns, owner, and merchandising products. - Describe different marketing strategies for retail properties. - Discuss retail leases and their specific clauses. - Explain how maintenance varies depending on the size of the property and the obligations of the tenant. - Identify administrative responsibilities and financial reports required by retail centers. - Describe classifications of industrial real estate. - Summarize required market information and industrial development incentives that are necessary for successfully marketing industrial space. - Identify specific issues for qualifying and negotiating with industrial tenants. - Explain the needs of ministorage center management. - Explain the general nature of leasing real property. - Describe the lease as a real estate transaction. - Explain how leasing is vital component to real estate practice. - Describe the differences in the types of leasehold estates. - Explain the general provisions of the Landlord and Tenant Act. - Explain the differences in the types of leases. - Identify four methods of risk management and the implications of each. - Describe insurance policies that the owner, the manager, and the tenant should carry, and discuss the need for and coverage of each. - List environmental laws and give a simple explanation of each. - Name environmental hazards and describe ways that the property manager can minimize their effects. - Plan employee information and training for dealing with hazardous substances. - State the reason for antitrust laws, and give an example of what not to discuss with competitors. - Describe the purpose of the federal fair housing laws and the protections that they offer. - Discuss the Americans with Disabilities Act (ADA) and Megan's Law. - Explain the protections offered by the Equal Credit Opportunity Act (ECOA) and the Fair Credit Reporting Act (FCRA) as well as the Uniform Electronic Transmissions Act (UETA) and the Servicemembers Civil Relief Act. - List the requirements of the Lead-Based Paint Hazard Reduction Act (LBPHRA). - Summarize the provisions suggested by the Uniform Residential Landlord and Tenant Act. - Identify the requirements of getting a real estate license. - State the required educational materials. - Understand what the laws require regarding relationships with clients and customers. - Answer questions regarding the real estate recovery fund. - List kinds of maintenance operations and give an example for each. - Explain the duties and responsibilities of various maintenance personnel. - Discuss the components of a cost-effective maintenance program. - Describe the issues concerning construction activities. - Summarize steps to increase and manage energy efficiency. - Design a life safety program utilizing personnel, equipment, and procedures to prevent an emergency, detect a breach, and contain and counteract the damage. - Describe the role of personnel in life safety situations. - Identify preparations for various emergency situations. - Explain how to prevent criminal activity on the property. In this course, you will learn everything you need to know to grow and build your career. In the first course, Texas Real Estate Law, you will learn the key laws and legal concepts that you will use every day in your real estate career: contracts, deeds, fair housing, foreclosures, land titles and records, leases, real property rights and land use. You will also learn about the Real Estate Settlement and Procedures Act, a federal law that regulates the closing and settlement of real estate sales. You will receive information on the Texas Deceptive Trade Practices Act and the Texas Statute that provides remedies for fraud in real estate and stock transactions. ​While as a real estate salesperson you are not expected to act as an attorney, it is important for a licensee to develop a thorough understanding of the various laws and statutes affect real estate transactions. TREC Guideline Update regarding PROCTORING of course exams. New guidelines now require students of this course to have their exams proctored , and you have the right to request a criminal history evaluation (where applicable) before enrolling in the courses or applying for a license. Renew online using TREC's Online Services. If you have not renewed online before, you may need to register first. Complete your SAE or MCE at least 10 days before your expiration date, to ensure time for processing. Some of our students have found that libraries will proctor the exams for no charge. We suggest you contact your local library. During the last two weeks of the month, we concentrate our efforts on processing timely submitted license renewals and supporting documents for license holders who expire at the end of that month. The processing dates provided are updated every Monday by 3:00 PM Central Time.